On every trip to London now I seem to catch a new film at a Curzon that I was unaware was on release because of the Netflix financed output. Last time it was ‘Velvet Buzzsaw’, before that ‘Bird Box’, before that ‘Roma’. Only one of these could I seriously recommend. I will not be subscribing to Netflix because sitting in my flat watching films has a limited appeal. The number of unwatched dvds waiting for a slot in my none-too-busy schedule attest to that. What appals me is that the latest Coen bros film and one of the Utoya couplet that came out this year were kept from me by a sporadic access to Curzon and its Netflix output. This is a London-centric viewing platform. You may as well just show these films at the BFI. If you cannot see the movie at an available cinema then it does not, for me, entitle it to any award, BAFTA or Academy. It is just a television film. The other ‘big beast’ in this row has just responded with a statement. Philip Knatchbull, CEO of Curzon defends his company’s actions and has a dig at Vue for being a multiplex chain with a poor record re screening specialised films. He wants to see the window closed for specialised films (and in reality it already is). Where he is on weaker ground is equating Curzon’s online operation with Netflix. He maintains Curzon’s online service has not damaged theatrical- but I don’t think the comparison holds up. I think many potential viewers of ROMA would probably not have been aware of Curzon’s operation. The whole business was poorly written up by mainstream journalists who said that ROMA was on ‘general release’ in cinemas. Very thorough Roy. 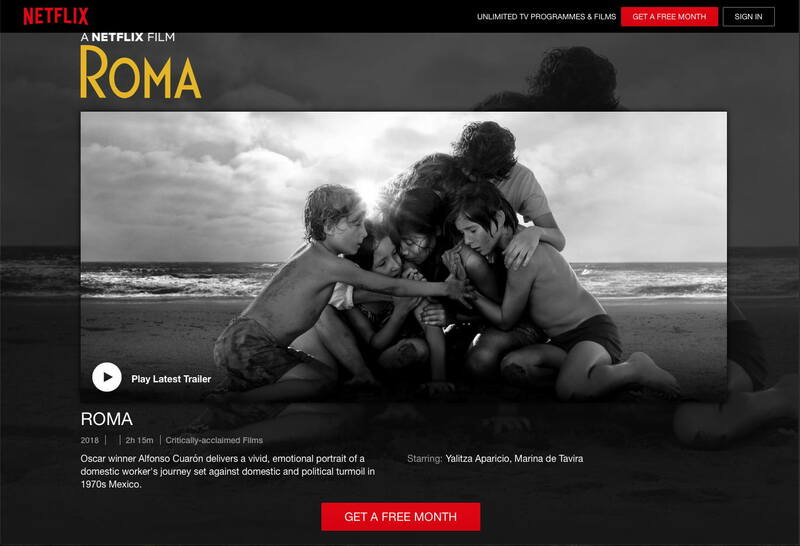 In fact I have seen ‘Roma’ at a friend who has Netflix. I am quite sure the film looks and sounds better in a cinema. So I am not planning to make a habit of watching Netflix. I have not been to a Curzon for several years. There is no doubt that these practices are aggravating the problem of accessing a variety of titles. One reason I went to the Berlinale was to see both 35mm and digital in proper cinemas. One I went to is the Kino Zoo Palast. As is my wont I asked about their projection equipment; the auditoriums are really nice. It turned out that the main screen can offer 35mm, 70mm, 4K digital and Atmos sound. So I asked if they had screened ‘Roma’. The reply was that, outside the Festival, there programme is only mainstream. I notice that Roy mentioned the BAFTAS. So ‘Roma’ received ‘Best Picture’ and ‘Best Foreign-Language title’. It would seem odd if it was not the BAFTAS. I shall be taking legal advice as you describe me as a ‘fan’ of Netflix! However I do have a subscription and it is invaluable for getting to see films that won’t even appear on DVD, still less find a theatrical distributor, in the UK. That said, ‘Roma’ would have done good business in cinemas meaning there was no economic reason for the restriction of its release; other than, of course, to drive subscriptions to Netflix. It comes back to the old problem of how unreceptive UK audiences are to foreign language films; I guess the last time subtitles were ‘fashionable’ was the 1960s (ie before my time)? Keith? Roy? Re John’s point about the Coen Bros. movie: you weren’t missing anything. I see two major awards for ‘Roma’ in last weekend’s Academy Awards. There may have been more as the Best Picture ultimately went to a likeable but forgettable film, and one based on unsound historical facts. Richard E. Grant hinted at this in a red carpet interview that offered the view that there was some intention to snub Netflix. Nonetheless, Best Director and Best Foreign Language. This should guarantee a second life for most films far in excess of their first run. Try and see this one without a trip to London. Two recent news reports: first it seems more European distributors are criticising the Academy and arguing against Netflix (but praising Cuaron). Second, it appears that the studios are giving up on developing their own download services, judging the current box office performance to be OK.
And now Cineworld/Picturehouses are withdrawing support for the BAFTAs. Long overdue. However, I wonder if the majority of BFTA members actually go to the cinema. In 2018 they awarded ‘Best British Film’ to ‘Three Billboards…”; or did Missouri opt out of the War for Independence in what is now the USA? And in an earlier set they ignored Charlotte Rampling’s career-best [that means something] performance in ’45 Years’.